Testosterone Factors™, 60 vegetarian tablets (Michael's Naturopathic) - Penn Herb Co. Ltd.
Testosterone Factors™ is ideal for proper male hormone production and for bodybuilders. 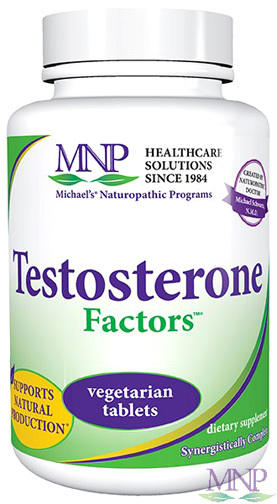 It provides nutrients in meaningful amounts essential for testosterone production and the reproductive system. The blend of vitamins and herbs includes phytosterols and the amino acid L-arginine. Vitamin C and Pantothenic Acid – For steroid hormone production, including testosterone. Niacin – Involved in the metabolism of cholesterol, a precursor to testosterone. Arginine – High concentrations in seminal fluid; a hormone building block. Gamma Oryzanol – Supports testosterone levels. Essential nutrients for testosterone production and the reproductive system. As a dietary supplement, take 1 tablet daily. Dosage may be increased as directed by a healthcare practitioner. CAUTION: Not to be taken by pregnant or lactating women.